Hello all! I'm back with another vendor spotlight interview where we find out more about local Louisville wedding industry professionals. Once again, I’m delighted to introduce to you to Randi Underwood, a Louisville-based Destination Wedding Photographer! She specializes in engagement and wedding photography and I’m so excited to share some of her work with you! 1. Please tell us about yourself. How did you get into wedding photography? I have been passionate about photography since I was a young girl. However, I didn’t decide to pursue it as a career until after working in the corporate world for a few years after graduating from College.While growing up, I saw how unhappy my father was with his career since he never had a desire for what he was doing. I realized after a few years, I was just wasting my life away working for someone else doing the same thing…and it was time for a change! I always knew I wanted my own business & this just seemed like the perfect job for me to pursue. I believe you only live once and should live life to the fullest. I actually got into wedding photography after I had a bad experience with my own wedding photographer. I chose him for all the wrong reasons…and in the end was not happy with the outcome of my pictures. At one point, I had explored all the other areas as well and decided wedding photography was the most exciting to me. I am in love with love. I believe the reason we are here on this earth is because of love. I believe everyone deserves and needs to have beautiful wedding images they can cherish forever. Once your special day flies by, you are left with nothing but the memories which will fade in time, which leaves you with only images. I know this sounds crazy, but I also love working under pressure. I think you are a better photographer if you can handle the stressful situations that arise at a wedding and still make it out with amazing images. I am also a very sentimental person. I love the idea of being able to freeze the important moments & events in time. And the part of photography that I love most is you are able to capture moments in ways that others cannot see. 2. Why do you think it is important for couples to hire a professional photographer for their wedding? There is a lot that goes into a wedding. We have the necessary backup equipment needed if something were to go wrong. It’s worth it to pay the money for that and not chance it by asking an amateur photographer whom never shot a wedding before. Not only that, a photographer who has experience working with weddings knows how to handle the tough situations that may arise out of nowhere because they are used to dealing with chaos on a wedding day. We also have the right lenses &professional grade equipment to get the job done! 3. What’s your photographic style? I am continually seeking new ideas, locations, & poses to satisfy my desire to innovate & make your wedding photos unique. My style is a modern and photojournalistic blend. I love bright colors as well as black and white images. I love to capture the real, candid moments of your special day while also giving a little direction on how to stand or sit so you feel like you can be natural in front of me, but also look your very best. 4. What’s your favorite part of a wedding to photograph? This is a very hard question. I absolutely love to take all the shots of the tiny details of your wedding day that make it unique and beautiful. But my absolute favorite ones are the first look. Whether you choose to see each other beforehand or during the ceremony, watching the love that two people share is absolutely beautiful. And I think I cry almost every time the groom sees the bride for the first time. 5. What is your favorite tip for couples for being photographed on their wedding day? RELAX! Laugh. Have fun on your wedding day. Take your time walking down the aisle and savor that moment. Enjoy each other and pretend no one else is around. 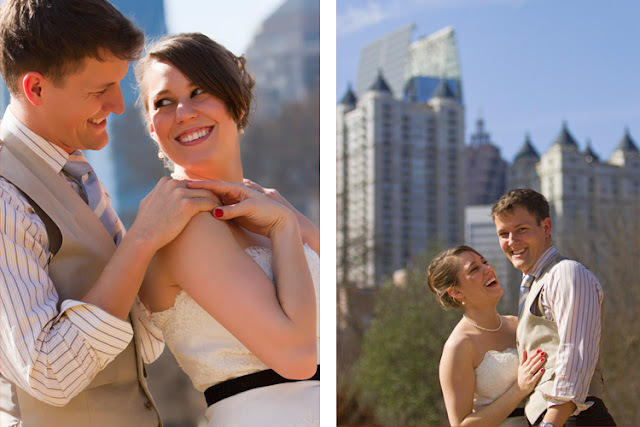 This will help you have natural photos of you and your new spouse enjoying your wedding day. Our brides (and grooms) book us because they trust us to let them enjoy themselves on their wedding day, as well as make them look fabulous at the same time! 6. When should couples begin thinking about photography in their planning process? 7. What advice do you have for couples when choosing a wedding photographer? One of the biggest mistakes you can make is choosing a photographer based off their price or by looking at the portfolio and booking them without even really getting to know them. While I think it is important to book your photographer based off their style, the most important question to ask yourself is do you get along with them? Do you two click? You will be spending your entire day with your wedding photographer and most of the time they are the ones running the show so it’s important that your personalities don’t clash. Also, make sure they have experience as a wedding photographer. Weddings are an entire different ball game compared to portrait photography. Click here to see the Original Post at the Louisville Wedding Blog. Louisville Wedding Blog est 2011. Powered by Blogger.